present as new and original an idea or product derived from an existing source. Plagiarism can also occur when someone else's ideas or conclusions are improperly paraphrased. It is not enough to simply change a few words in a sentence or put several sentences in a different order; if what you have written largely resembles the text you are referring to, you should either reword your paraphrase or use that text as a direct quote. Proper paraphrasing takes practice - you will have that opportunity later in this tutorial. Even a properly written paraphrase needs a citation, however, as the ideas or conclusions are those of the author and not your own. Family discussion: how can parents and/or tutors assist students with homework in an ethical manner? It's a reasonable, honest choice. You will get the sleep you really need, and you won't have plagiarized. Your teachers will let you know how much time you can expect to spend on homework at night; if you have gone well over that time, it's probably time for bed. It's the easy way out, but it's plagiarism. It's also a violation of Menlo's academic integrity policy and of the trust placed in you by your teachers. Besides, how are you going to going to learn Spanish if you don't practice? You'll be tired, but your homework will be done, and it will be your own work. No plagiarism here! Next time be sure to write down all of your assignments while in the classroom, and complete your work in time to get a good night's sleep. 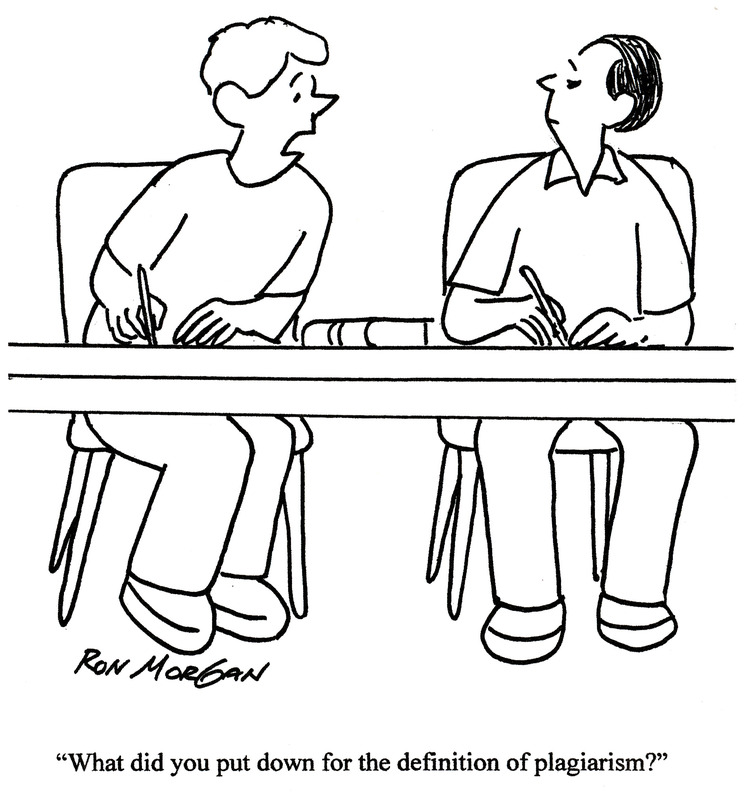 The word plagiarism comes from the Latin word plagiarius which means "kidnapper." You don't want to kidnap someone else's idea, right? The cartoons used in this tutorial were purchased from Cartoonstock.com. The license allows online use for educational purposes as long as the website is not open to the public, which is the reason the tutorial is password-protected.